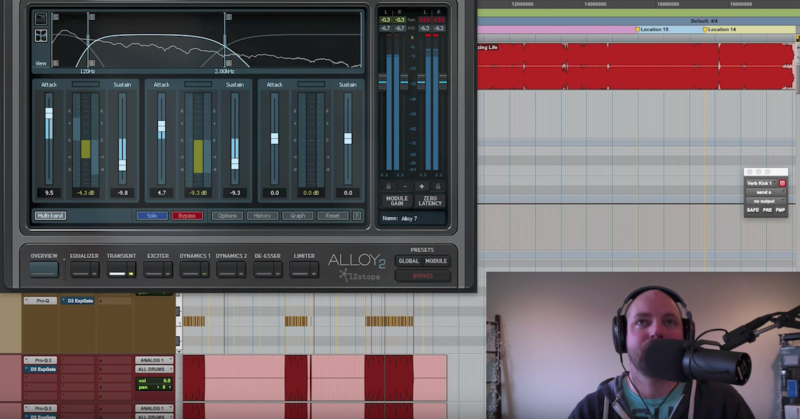 Which EQ Should You Choose? Hey folks, Matthew Weiss here — weiss-sound.com, theproaudiofiles.com. Well, when I’m listening to an equalizer, I’m sort of thinking of three things. The first is the shape of the filters, the second is the transient response of the EQ, and the third is the overall tonal characteristics and personality that I’m picking up from the plugin. Alright, so what I’m going to do here is play this drum riff, and then I’m going to bring in some different EQs, and I’m going to point out how all of those different things are coming into play. The filter shape, the transient response, and the tonal characteristics. Alright, here we go. Alright, so off the bat, it sounds like a pretty good sounding drum kit, but it could be a little bit stronger, right? It could have a little bit more spark in the top end, it could be a little bit more assertive in the mid-range, and it could have a little bit more weight in the deep lows where the kick is living at. So I’m going to start with what I would consider a very distinct EQ, and by that I mean that when you turn on the EQ, the personality of it becomes very clear. So what we’re going to hear is there’s a very distinct quality to the overall tonal characteristics, there’s also a very distinct shift in the transient response, and we’re also going to hear some very broad slopes, meaning when I boost a certain frequency, I’m going to be boosting a very wide band. It’s not like if I boost 10kHz, I’m just getting 10kHz and above, it’s going to be like when I boost 10kHz, we’re going to hear stuff as low as 3kHz coming up. Alright, so let’s check that out and see how that sounds. By the way, right off the bat, the moment I unbypass this EQ, the PSP E27, listen to the hi-hat. Listen to the top end carefully. Just by bringing it out of bypass, you hear the hi-hat become accentuated a little bit. That’s because there’s a harmonic quality I would describe as “shiny” to this EQ. It’s got a very specific quality in the top end, and once I start boosting it up, you’re going to hear it pretty readily. That’s pretty distinct. Now, I would say that first of all, if we listen to the quality of the snare, we’re getting way more than just 10kHz right off the bat. We’re getting like, 2kHz, 3kHz, 4kHz, 5kHz, 6kHz, all the way up and over. Listen to the quality of the snare in particular. It’s like the whole bitey-ness of the snare starts coming up, which can be really good or really bad depending on what we’re trying to do. Now, the transient response is very distinctly different. If we do a little bit of compensation with some makeup gain, let’s say like, I don’t know, maybe 2dB? A dB and a half? Let’s bypass those. You hear that the snare, it kind of rounds out in an interesting way. It becomes spikier in the sense that the top end of the snare and the upper mid-range of the snare is becoming more accentuated, but the actual dynamic quality of the snare is becoming a little bit rounder, which is a really unique affect, and it’s one of the things that I keep in mind about this EQ. A lot of times, I don’t want to have it on drums because it will do that. Sometimes I want it specifically for that reason, but a lot of times I don’t, but sometimes I’ll want it on vocals exactly for that reason, because it’ll round out the sound of the vocal a little bit in a dynamic way which is kind of cool. Alright, let’s play around with the low end a little bit. Again, a very broad slope. I have it set to a corner frequency of 63Hz, but we can hear the entirety of the kick drum coming up. The whole thing. Everything that’s happening at 150Hz, 200Hz, going up right into the lower mids. So on this particular drum kit, I would say I don’t necessarily love the sound of what it’s doing to the top end. I would say it’s adding a little bit too much harmonic color up there, and it’s making it maybe a little bit too round in the transient, but I really like what it’s doing to the low end. It’s really complicating the kick in a cool way. Right. So this is what I’m thinking about when I’m grabbing an EQ. Now, let’s go to the opposite end of the spectrum. Let’s look at something that’s very what I would call transparent. The Air EQ by Eiosis is completely seamless. Listen to what happens when I start boosting up 10kHz. Notice how the snare drum sort of stays in the same place. It’s really a much tighter filter, meaning it’s getting much closer to only 10kHz and above, a little bit of the stuff below, but nothing nearly as broad. So the snare is staying more in place. It’s a little bit more targeted. Now, I can adjust that by changing the Q here. I can make it pretty broad. But even at its broadest, I would say it’s still a little bit tighter than the PSP, which is a very broad slope. So again, not necessarily better or worse, it’s just a characteristic. Now, one of the really cool things is the transient response here. Let’s follow through with this entire process. Let’s do a little bit of treatment and then do some level matching here, and we’re going to listen to the dynamics of the drums. Okay, so this is a little bit hard to focus in on because the tone curve is changing, but listen to the way the dynamics of the drums sit, particularly the snare. That’s always a good beacon for listening to dynamics. Notice how dimensionally, like in terms of the amplitude shape of everything, it feels like it’s pretty much exactly the same, there’s almost no change. That’s kind of a cool affect of this EQ. It means that we can do a lot of precision work with almost no artifact in terms of how the transients are living. Now, let’s also talk about the harmonic characteristics. The PSP, as soon as we clicked it in, it had a certain shimmery quality to it. It had a character to it right away. The Air on the other hand, it has really almost no character at all. It’s importing very, very little harmonic change. Really if there’s any, I can’t hear it. So again, not a good thing or bad thing, it’s just sometimes we want something that’s super crisp and transparent, sometimes we want something that has a flavor to it. Now let’s just compare that to say, the PSP real quick. Let’s do something similar. We did a little bit of boost at 800Hz. We have the kick coming up a bit. Let’s hear how that sounds. Right? Very distinct, almost excited quality, as to say, the Air. Very crisp, keeps the dynamics exactly intact. Now, I want to pull up one more EQ here. We’re going to pull up the Slate FG-S, which is an emulation of an SSL style EQ, and SSL EQs are known for being particularly punchy, so we’re going to really listen to the transient response in particular, and see how that measures up against what we just heard. And again, let’s throw on a little Trim plugin here just to kind of level match things. Alright, cool, so now what I want you to do is listen to the shape of the snare again. Listen to that transient response. Let’s level match it a little tighter. There we go, that’s level matched. So listen to how the snare starts popping forward. It’s like the dynamic is actually being accentuated a little bit. The transient is being enhanced slightly, which again, not a good thing, not a bad thing, it’s just a thing, but a lot of the times, SSL style EQs are really what we’re looking for on drums because they have that particular characteristic. Now again, we have variable slopes here, we have variable curves, but I would say that this is a little bit broader than — for the fixed curves, it’s a little bit broader than the Air EQ default, but it’s a little bit tighter than the PSP E27. So we’re going to get something that’s a little bit tighter sounding than the PSP, and a little bit less harmonic mojo. I moved the corner frequency on the snare down just a little bit and broaden the Q… Let me broaden this Q here. Now it’s a lot closer to what we were getting before. But still distinctly different. So these are the things that I think about when I’m deciding, “Okay, what EQ is probably going to be best for which job?” and the fact is that most of the time, they are interchangeable to a certain degree, but really, what I’m going for is what I think is going to be ultimately absolutely best. It’s subjective, it requires a little bit of taste and a little bit of experience, but by having that there, we can get closer to what we’re looking for faster, we can get a little bit of magic into a mix that maybe wouldn’t be there with other choices, and ultimately we end up getting the best results. Alright guys, if you dig this video and you want to know more about EQ, I have a full length tutorial out, it’s called Mixing with EQ, and it can be found at mixingwithEQ.com. It gets really in depth as far as the technical side of what’s happening with an EQ, as well as all of the creative applications, including things like working out the balance of the mix, getting it to special effects, and of course understanding the topology of what’s going on under the hood, so you have a really thorough understanding. Also if you like this video, don’t forget to hit that like button, and if you want to see more of these videos coming through our channel, hit that subscribe button as well and I’ll catch you guys next time.